Rivet Nuts | Threaded Inserts | Blind Rivet Nuts | Jay-Cee Sales & Rivet, Inc.
A rivet nut, also known as a threaded insert or a blind rivet nut, is a mechanical fastener that, as the name suggests, is a variation of the standard rivet. 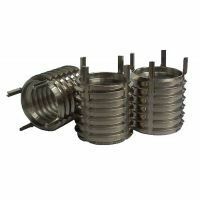 This one-piece, threaded, counter-bored tubular rivet can be anchored entirely from one side of the material in which it’s installed. Looking for Rivet Nut Kits? Jay-Cee Sales & Rivet offers complete rivet nut kits that include everything you need. 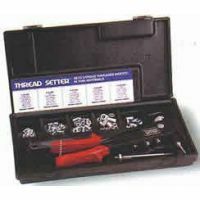 Our rivet nuts kits and blind rivet kits include an assortment of fasteners (from 50 to 200 pieces in various sizes, depending on the kit), along with installation tools and/or other accessories. There are two basic types of rivet nuts, both of which are engaged by tightening a screw into their threads: one style is designed to form a bulge on the backside of the panel; the other is drawn into a sleeve. Jay-Cee Sales & Rivet stocks threaded inserts in both types and in a variety of styles, sizes, and materials, making it easy to find the right option for your needs. Follow the links below to find rivet nuts for your application, request a quote, or contact us for more information. With our huge, in-stock inventory, we’re sure to have rivet nuts your project requires. We offer standard threaded fasteners in steel, stainless steel, and aluminum. Our selection of specialized rivet nuts includes blind threaded studs, jack nuts, and pre-bulbed and straight-shank steel cross nuts. All six styles are available in a range of sizes and configurations. If you can’t find threaded inserts in the right size or style for your application, or if you’re not sure which option is right for your needs, please don’t hesitate to contact us. We’ll be happy to help you find the rivet nuts you need. And if we can’t find it, it probably doesn’t exist! Make Jay-Cee Sales & Rivet your first choice for rivet nuts—we offer premium quality fastener products at competitive prices and fast, on-time deliveries. Order rivet nuts and rivet nut kits for your application today, request a quote, or contact us to learn more.